This luxury home perched atop a huge lot in Eagle Mountain is truly something special. An incredible top-to-bottom renovation was completed in 2015 by Georgie Award winning builder Rockridge Developments, and this stunning home shows like a brand new build. With upscale European styling throughout, features include a designer colour scheme, beautiful wainscotting, weathered oak wide-plank flooring, high end tile and marble, as well as natural fibre carpeting. The formal living and dining area is elegant, grand, and perfect for entertaining. The family room feels warm and inviting with beautiful built-in bookcases that surround a marble flanked fireplace. Adjacent is the gorgeous open-concept kitchen, with plenty of granite countertops and a huge island featuring a reclaimed wood countertop and built-in wine racks. High end stainless steel appliances are 2011 Whirlpool Gold. Outside you'll find a beautiful patio complete with a BBQ, wood burning fireplace, and lounge area. The private fenced-in backyard has lots of room for children and pets to play. The master bedroom features an amazing spa-like ensuite with quartz countertops, Carrera marble tile floors, a huge shower, and an even bigger soaker tub that is guaranteed to melt your worries away. 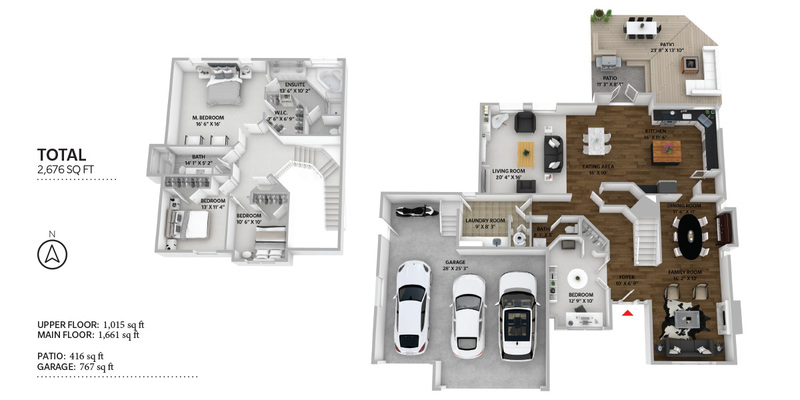 Three additional bedrooms mean plenty of room for everybody. A spacious and well-appointed laundry room is an organization-lover's dream, and the three car garage could easy double as a workshop. The entire exterior of the house was painted last year. There's nothing to do but move into and enjoy your beautiful new home on one of Eagle Mountain's best streets.